By the time we got to Barcelona, we'd already fallen in love with Dublin, Liverpool and Paris. When we planned a trip to four European cities, we didn't think about the toll that the logistics of travel can take, or how a certain numbness from being enchanted so routinely can set in (I know, sob story, violins...). In any case, Barcelona did not get her best visitors in us. A Tale of Four Cities is a series of travel notes from Maddy Lederman's recent trip abroad. Making matters worse, we'd never been to the Catalan capitol before, so we could not opt out of its significant cultural offerings the way we smugly passed up the three-hour lines to world treasures on display in Paris. We would suffer the crowds that come with global attractions. An historic and romantic city, Barcelona had plenty to charm us even as weary travelers, but like many relationships, it was complicated. If you don't know Gaudí's work, you might think his buildings look like something out of The Lord of The Rings or Star Wars, but this influence goes the other way around. Gaudi worked from the 1880's until the 1920's, and his whimsical, flamboyant, "Modernisme" style of architecture has been echoed in countless fantasy and science fiction films, TV shows and video games. 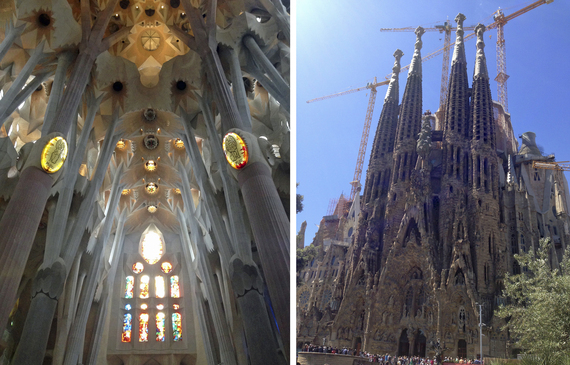 There is a wealth of his architecture in Barcelona spanning residential, commercial, public and religious use. 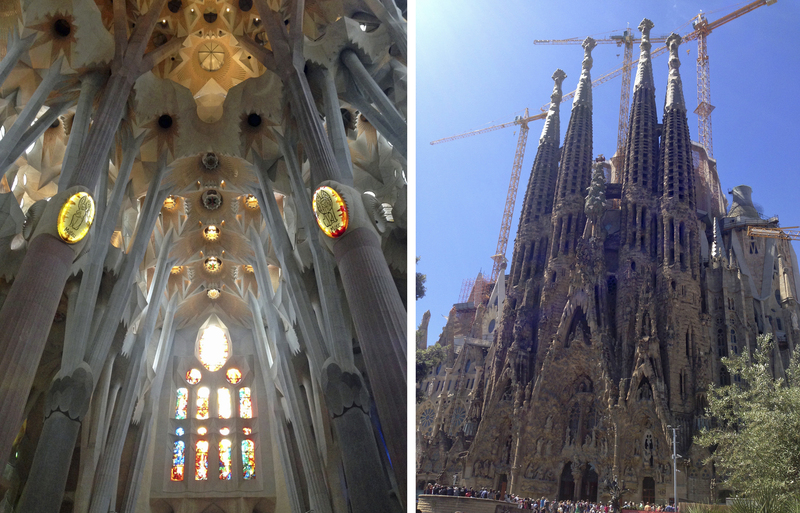 A visit to Gaudí's monumental cathedral-in-progress, The Sagrada Familia, is essential and likely to require a dose of patience. The line for ticket holders went around the block, but when faced with Gaudí's outrageous ambition, his love of nature and his tenacity for details, the crowd around you melts away, and his unfinished cathedral is astonishing. Gaudí's catherdral should be complete in 2026. Photo by Maddy Lederman. The original city known as Barcino was occupied by the Romans in the 2nd Century B. C., and as a result, present-day Barcelona has plenty of Roman ruins. An ancient wall looms over an open, city square. An entire Roman neighborhood lies under a centuries-old (yet relatively newer), medieval church, and another one is beneath the site of a once bustling, industrial-age street market. 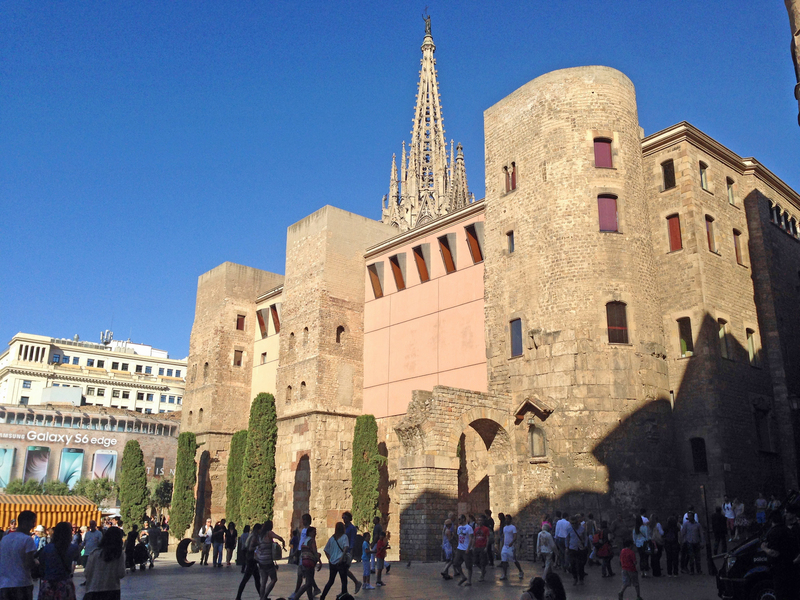 Barcelona's history spans millennia, and it's layers are exposed. Portions of the Roman city wall at Plaça Nova. Photo by Ray Carter. The Gothic Quarter, also known as the Old City, is a labyrinth of narrow streets winding through terrace-lined apatment buildings that block most sunlight and cell phone service. A paper map is recommended for navigating this charming enclave of boutiques, thrift stores and cafés, because you'll need help finding all the tapas bars you decided to try later. Darkness in the Gothic Quarter. Photo by Maddy Lederman. When you start to crave sunlight, a cable car ride up Mont Juic provides invigorating views of what you might have forgotten is a city along the sea. Up here is a military fort and a cultural museum, and lovely garden walks along the mountainside. Nice ride up Mont Juic. Photo by Maddy Lederman. There is also plenty of sun at the beach. La Barceloneta is the neighborhood that runs along the Mediterranean, and it has a lively, urban beach scene. Music from bars, restaurants and other beach go-ers is inescapable, and people selling blankets, beers and rum cocktails are aggressive and hard at work. The most persistent salespeople I've ever come across offered massages, and they demonstrated a different measure of personal space as they stood over me, blocked the sun and repeatedly yelled: "Massagie!" If you are approached by someone yelling "Massagie!" on a Barcelona beach and you don't want one, don't make eye contact or react. The best strategy is to play dead. After putting off several Massagie women this way, I eventually caved, and it turned out to be a fair deal for a decent, fifteen minute rub down. It was also a good way to stop more Massagie women from targeting me. Drinks and a massage at the beach. Photos by Ray Carter. Another reason we were unfair to Barcelona as travelers: it was time to start tightening the belt. We were spending more than we thought we would and, into the fourth week of the trip, the rationalization that certain things were worth it simply because we were near them was becoming less convincing. So, along with "tired" and "numb," we can also add "cheap" to our list of limitations. But looking for a way to enjoy fresh seafood without a huge restaurant bill every night turned into a fun, authentic experience when we came across La Paradeta. La Paradeta is a cross between a fish market and a restaurant, and there are three of them in Barcelona. They catch off their own boats daily, and will grill what you choose or cook it in tomato sauce. It was a fun, casual alternative to restaurant dining and a great way to enjoy Barcelona's freshest seafood. We also found Restaurant Koxkera in Les Corts, the banking district: this friendly, neighborhood gem serves traditional paella and coquina (sweet, tiny clams cooked with garlic, I will never forget them). Seafood-Within-Reach at La Paradeta and Restaurant Koxkera. Photos by Ray Carter. Never saw this guy before. Photos by Ray Carter. 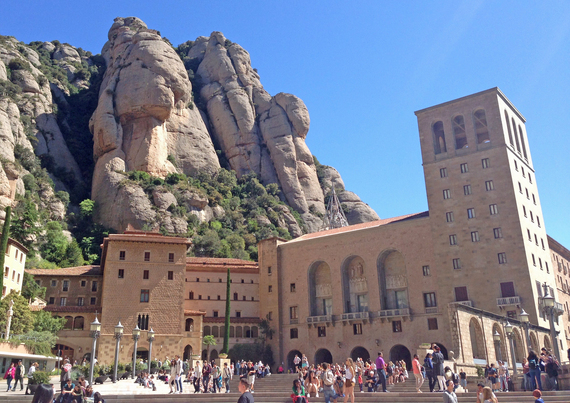 Montserrat (serrated mountain) is named for its jagged peaks and famous for the Santa Maria Monastary of Montserrat, a Benedictine monk retreat built for the worship of the Black Madonna, a.k.a. 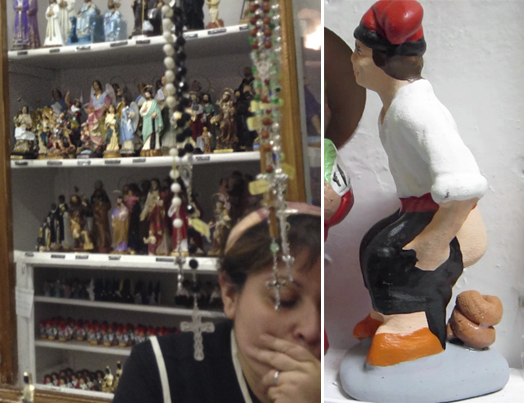 The Virgin of Montserrat, La Moreneta, and the patroness of Catalonia. (Never heard of her? Neither had I.) She is a wooden statue that carbon dating suggests is about 800 years old, and a religious icon that believers make pilgrimage to by the thousands every year. Whether you are religious or not, this stone monastary built into the rugged mountainside makes for a stunning scene. Photo by Ray Carter. We arrived early, amidst bus loads of tour groups. Our sights were set on Sant Jeroni peak, the highest point of Montserrat. The picturesque and strenuous hike was peppered with mountain goat sightings and short conversations with hikers from everywhere, and eventually led to what seemed like an endless series of stone stairscases jutting into the sky. There were moments when I turned the corner of another switchback and thought,"Oh no, I can't make it," but the incredible views to the Pyranees and the Meditterranean, along with a solid sense of accomplishment, were rewards when we got to the top. Resting at Sant Jeroni peak. Photos by Ray Carter. When we returned to the monastery it was late afternoon, less crowded, and the perfect time to see the Black Madonna. The line starts outside, then takes you in and up a dark staircase lined with rich, wood panels and tiled mosaics of religious scenes. At the top is a platform ornamented in gold where the Black Madonna sits on an altar. People had come from far and wide to see her, and the electric energy in the air was contagious. The Black Madonna has the Baby Jesus in her lap and she holds an orb that juts out of a hole for it in the glass case protecting her. 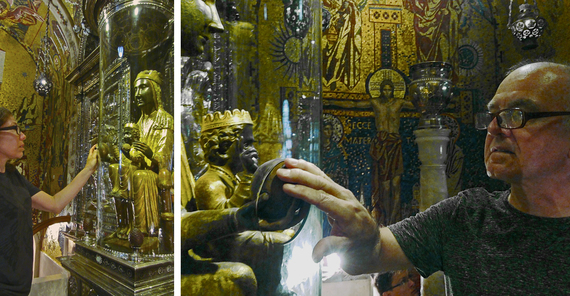 Each visitor gets a moment alone with the Virgin, and can touch the orb while he or she prays. A moment of peace with the Black Madonna. Photos by Ray Carter and Maddy Lederman. Gald we didn't rent a "holiday apartment." Photo by Maddy Lederman. 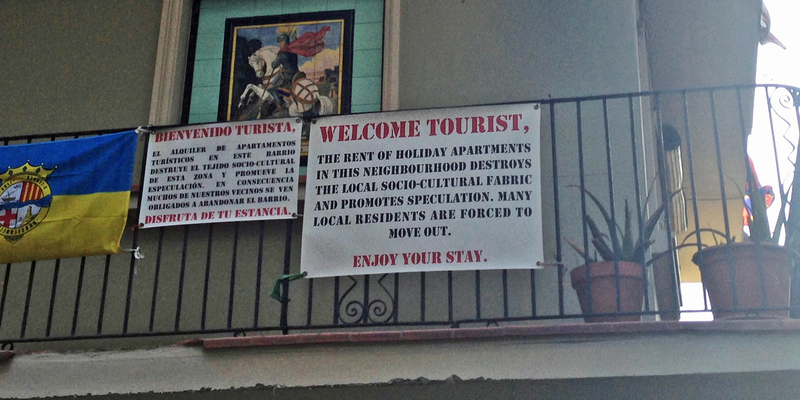 Some people in the Catalonian capital are not happy to welcome tourists and, between the crowds and the economic issues, there is no denying they have reasons. Passions run deep in the city on a variety of fronts: here for Catalonian independence and a certain football club. "We Are a Nation, We Decide." Photos by Ray Carter. 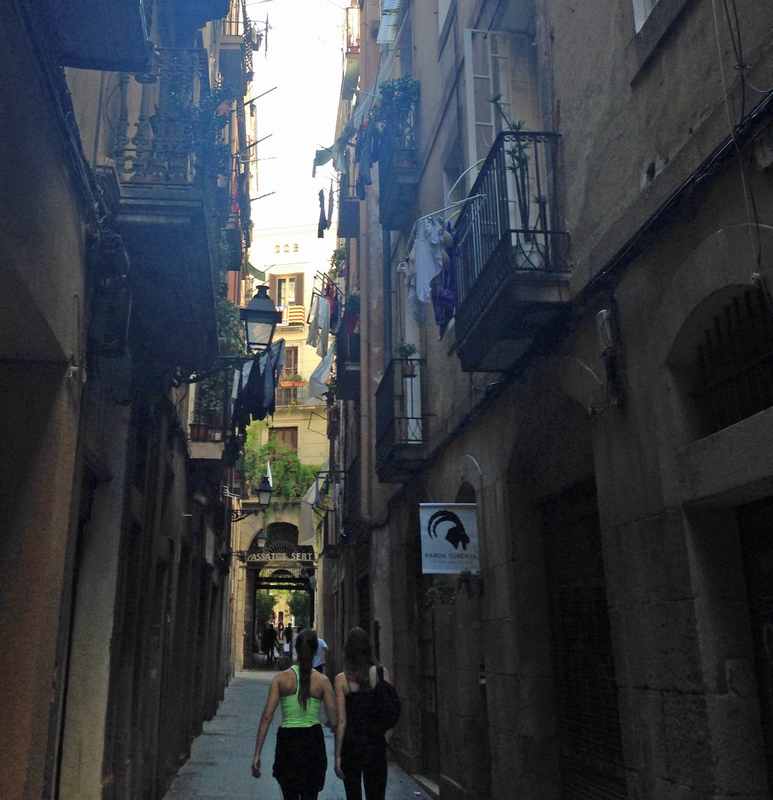 A Tale of Four Cities is a series of travel notes from Maddy Lederman's recent trip abroad. Previous cities: Dublin, Liverpool and Paris.